This listing is for a one day candle lighting and petition to San Martin Cabalerro (The Horserider)/Saint Martin of Tours. San Martin Caballero is the one most frequently encountered in luck charms or workings. Born in Hungary during the late Roman empire, he was pressed into service in the Roman army, where he became a centurion. One day, while riding his horse, he chanced upon a near-naked beggar and cut his cloak in half to give the man a covering. That night he had a dream in which the beggar appeared to him as Jesus, so he quit the army and became a monk in Italy. He was later promoted to the rank of Bishop of Tours (in France) but always lived a simple life and gave a great deal to charity. 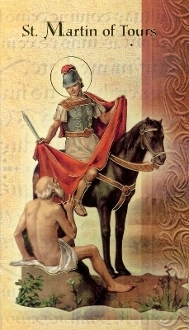 Saint Martin is the patron saint of those who hope strangers will aid them. He is who I pray to for all matters concerning business and finance. In Mexico Saint Martin Caballero is especially popular among shop-keepers who rely on the kindness of passing strangers for their livelihood. Also among professional drivers of any type who see in his horsemanship a parallel to their own manner of earning a living. The horse he rides is associated with the lucky horseshoe so he is also a favorite saint among gamblers. Some identify him with Eleggua, probably because he is associated with crossroads and, hence, travel. Please leave your request in the "notes" section.